Discover Indonesia by visiting the historical, cultural and wildlife sites in 10 days. Arrive Jakarta, a bustling city and the capital of Indonesia. Take a flight to Pangkalan Bun, for Tanjung Putting National Park, the Orangutan Rehabilitation Center where orphaned individuals are trained to live in the wild. Continue to Borobudur, one of the grandeur of Buddhist monuments in the world, and enjoy a dramatic and exotic sunrise from the top of Arupadhatu. On the way to Jogyakarta, see the active volcanic craters of colored and mirror lakes. 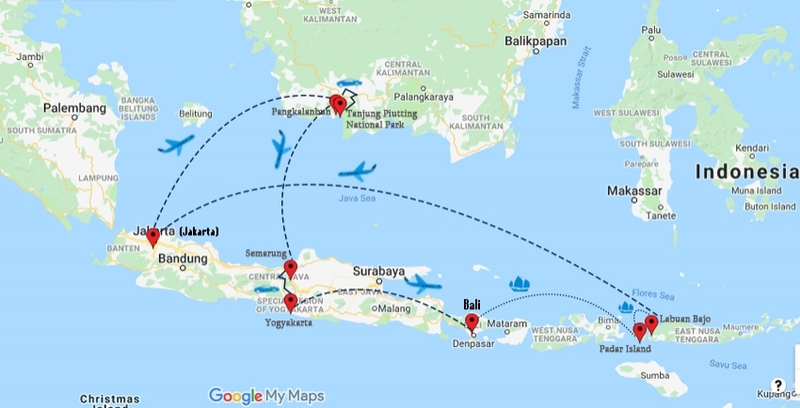 After the tour in Yogyakarta, you will fly to Bali, continue to Labun Bajo and sail to Kelor Island. Here you will enjoy the exotic fauna and wildlife. You will also have an opportunity for snorkeling here or in Kalong Island. Continue to Pink Beach that offers a beautiful marine life of corals and colorful fish before returning to Jakarta. Day 01 Arrive Jakarta and transfer to hotel. Day 02 Jakarta -Pangkalan Bun- Tanjung Piutting N. P.
Upon arrival in Jakarta, you will be met and transferred to hotel. An early morning flight gets us to Pangkalan Bun from where we drive to the pier in Kumai and board our Klotoks - a traditional wooden river boats with a roof to navigate among the streams at Tanjung Putin National Park. The park serves as an orangutan rehabilitation Centre, where orphaned or formerly captive individuals are trained to live in the wild. We view the daily hour-long feedings of the orangutans at various jungle platforms. The river cruise will be our first real experience in the rainforest watching birds and wildlife. A delicious Indonesian lunch cooked onboard is served. After about 2 hours cruise we reach our first stop at Tanjung Harapan, where we take a short walk in the jungle to an orangutan feeding station. We may be fortunate to see orangutans in their natural habitat too. After our visit to the feeding station, we navigate up river to the Rimba Lodge. Overnight at Tanjung Putting National Park. A day of nature exploration at its best! Today we are in for more exciting possibilities of orangutan sightings as we take our boat to the feeding station at Pondok Tanguy. Here orangutans are fed in the mornings. After a short jungle walk we return to our boat and continue to explore the rainforest while enjoying another delightful lunch prepared by our boat crew. We then arrive at the famous Camp Leaky and trek through the jungle on an easy path to the feeding station located here for the afternoon feeding. We then return with our boat to our lodge for the evening. At the appointed time, transfer to the airport of Pangkalan Bun, then fly to Semarang. Arrival in Semarang , meet a tour guide and transfer to your hotel in Borobudur. Back to hotel and breakfast. Check out and leave for Dieng Plateau tour. Arrive at Dieng, you will See the active volcanic craters or take in the beauty of the Warna (coloured) and Pengilon (mirror) lakes. Afterward transfer to hotel in Yogyakrta for overnight. Morning tour of Yogya City, visiting Sultan Royal Palace, Water Castle (Taman Sari), processing of batik at Batik Home Industry, and processing of silverware at Kotagede. Afternoon proceed to Prambanan Temple, and then transfer to airport for flight to Bali. Arrival in Bali, transfer to hotel close to airport. Morning transfer t Airport for flight to Labuan Bajo. Arrival in Labuan Bajo, meet your guide and drive to harbor to catch your boat and sail to Kelor island, where you could do snorkeling. From Kelor island we will then continue boating to island Rinca. Upon arrival, together with your guide and the forestry rangers, you will be trekking on the island, exploring the wildlife as well as the exotic fauna. Lunch will be served on board. proceed boating to Kalong Island, a small island covered by the mangrove trees surround the island and is the ideal habitat for the bats (flying foxes). In the late afternoon you will enjoy spectacular view when thousand of bats flying out from the island in searching for food. Adventurous, healthy and fresh dinner will be prepared for you before you go to bed on the boat. After breakfast, we sail to Padar Island to do snorkeling. Afterward to Loh Liang Station on Komodo Island, where we will do an hour trekking to Banugulung, former feeding ground to see Komodo in wild. During our way to Banugulung you will see other wildlife such as wild pigs, deer and various colorful birds. Return to your boat for lunch, then a continue to famous 'Pink Beach' that offers a beautiful marine life of corals and colorful fish. During Breakfast, our boat sail toward to Manta Point. Manta point is the suggested point to snorkeling as well. If you are lucky, you may get the experience of swimming with the mantas. Although seeing Manta Rays can't be guaranteed, you could sea turtles, barracuda, and other various fish. After Manta, we will sail to Labuan Bajo. Lunch will be served on board. Arrival in Labuan Bajo and transfer to airport for flight to Jakarta. Transfer to airport and fly back home or extend your trip to Malaysia or other parts of Asia. All land transfers as mentioned. All entrances fees as mentioned. National Park Ranger where required. All applicable local and government taxes. U.S. citizens do not need a visa if you are visiting as a tourist and staying for less than 30 days. All the other permits and entrance fees are included in the trip. You will be staying in nice, comfortable accommodation with attached bath. Your breakfast is always included. Lunch and dinner are included as per the itinerary. When not included, a decent meal will cost you about $ 10-12 in tourist class restaurant. If you like to upgrade it to higher end hotels, that is also possible with additional price. We provide an experienced driver and English speaking local guides during the tour. You will be traveling in comfortable private car or van or mini bus with driver and guide depending on the number of people in the group. During boating trip, we provide experienced boat captain, crew, cook and guide as well. Yes, you can extend your trip to Malaysia, Singapore or destinations in Asia. You may like to inform this at the time of booking the trip, should you book the international flight with us. We would be happy to arrange your extension as well.